EVER WONDER HOW ANNA'S FIRST COMMISSIONED SONG CAME ABOUT? Did you know that in the past she has always played it cool? She said, Do you like him? Tell me! Tell me! Do you? And did you know that in the past she has always played it cool? To have and hold, let life unfold, and learn to grow beside you? song it was--I have to admit, that's a little unusual considering our rather cynical, sarcastic senses of humor. I admit, it can still make me cry. And it is something I listen to around our anniversary, every year. Working on this song ten years ago was my first taste of what it can be like to really take in someone else's message--both the things they are saying, and the things they are not saying--and weave it all into a song. Once I had a taste of it, there really was no turning back! I have been doing it ever since, creating songs for new babies, grieving family members, giving voice to those who have passed on, creating a song for an African Tribe that tribe members still sing every morning after saluting their flag, and even once in awhile getting to do very silly songs, like the recent Man of Action Theme Song. It has been a wild and wonderful journey, and I will be eternally grateful to Sheila Heen for, clearly, hearing not only what I was saying, but what I was not, in terms of where my future might take me. To all of you for whom I have had the honor of creating a song....thank you for ten years of truly astonishing, unexpected, amazing, learning-filled journeys. And for those of you out there who will become my future commissioning journeymen and journeywomen--I can't wait to meet you! I am so grateful for this path I get to walk. Thanks, each of you, Song-of-the-Month subscribers, for being a part of it. And thanks to Jill and Jason whose marriage, by all accounts, seems to be going as gangbusters as my commissioned songwriting! Long may both wave! 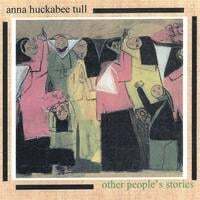 That's Anna Huckabee Tull on vocals, Ksenia Mack on acoustic guitar, Katrin Peterson on percussion and Larry Luddecke on piano. Together, we four brought "Because I Do"to life--the very first AHT Commissioned Song!